Nisanohashinoi-jinja is included in both the Engishiki and the Izumo Fudoki. It’s believed to have a deep connection to the ‘Nisa’ shine mentioned earlier in the Sezaki-ura article and can be assumed to be geographically close, too. The ‘Noi’ part of the shrine name, ‘Nisanohashinoi’ is noticeable as the connection to the current bay name Noi, albeit written with different characters nowadays. Putting together the area name, the shrine and that of the ‘Aza’ location of ‘ Miyawaki ‘, it can be hypothesized that this shrine followed quite a linear passage down through to modern times. 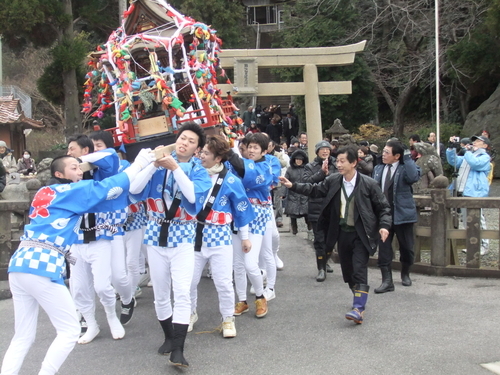 A point of interest is the ‘Hinomisaki’ shrine name. It would appear that it was desirable to have a shrine with the name Hinomisaki, it being listed in the Engishiki along with other shrines of great standing. Considering this, it is understandable that during the Edo period, there was much prestige and significance to shrines with the deity Amaterasu Oomikami , which may explain the existence of Hinomisaki-jinja here. The ‘kamuri’ part of this name could be assumed to be related to the word ‘kamori’(protector god). The history is complicated, but back in the Edo era, ‘Hinomisaki’ and Kamuri-myoujin (Kamoridaimyoujin and Nisanohashinoi) were different shrines enshrined close together, but upon entering the Meiji era, perhaps with changes in the importance of the Engishiki, Nisanohashinoi came to the forefront with Hinomisaki taking a more subordinate position and ultimately becoming enshrined into Nisanohashinoi. The modern location of Nisanohashinoi, ‘Aza Miyawaki’ could be deduced as being in reference to the ‘Miya’ (shrine) and ‘waki’ (side) of Hinomisaki jinja. Local man Omura Washiro Shigeyoshi, during his pilgrimage during the Keio era, noted he worshipped at the shrine, ‘Kamori-daimyoujin’, but this was in fact Nisanohashinoi shrine. The former location of ‘Kamori-daimyoujin’ was to the south of the current location in the area of the Noi Children’s hall in Aza ‘Kamorinadasama’. Going up the stone steps to the shrine, on your left, you’ll come to the mysterious hand carved steps. As you go up contemplating all the changes that have gone on around these steps, you’ll come to the hall of worship. There are several bamboo pipes, used in the Shiokumi ritual hanging from the tree on the side of the hall. It is a custom at Noi to offer seawater drawn from seven spots along the shore as part of the forty-nine day mourning period. As you come down from the shrine, you are greeted by the cobalt blue sea. The Koma-inu (shrine guardian dogs) on your left and right are surprising in that they are also guarding their young down at their feet. The Noi Tondo is on the second Sunday of January. 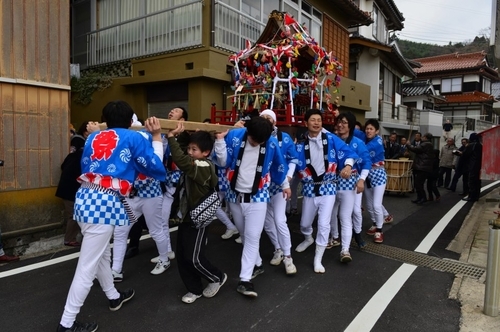 As adults and children beat time with a traditional taiko drum, the o-mikoshi is carried through the town. Those boys who pluck up the courage can try on the large lion mask which is used to pray for the health of local children and have a commemorative photo taken. All ages of residents can join in prayer to wish for a successful start to the year.